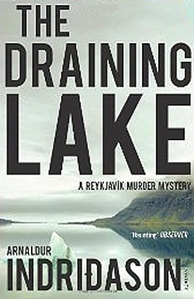 “The Draining Lake” is another rewarding chapter in Arnaldur Indridasun’s Reykjavik murder mystery series. In the wake of an earthquake, the water level of an Icelandic lake drops suddenly, revealing the skeleton of a man half-buried in its sandy bed. It is clear immediately that it has been there for many years. There is a large hole in the skull. Yet more mysteriously, a heavy communication device is attached to it, possibly some sort of radio transmitter, bearing inscriptions in Russian. The police are called in and Erlendur, Elinborg and Sigurdur Oli begin their investigation, which gradually leads them back to the time of the Cold War when bright, left-wing students would be sent from Iceland to study in the ‘heavenly state’ of Communist East Germany. “The Draining Lake” is another tense Indridason mystery about passions and shattered dreams, the fate of the missing and the grief of those left behind.